In this post, I’m providing some guidance on how and when to decouple Drupal. Almost two years ago, I had written a blog post called “How should you decouple Drupal?”. 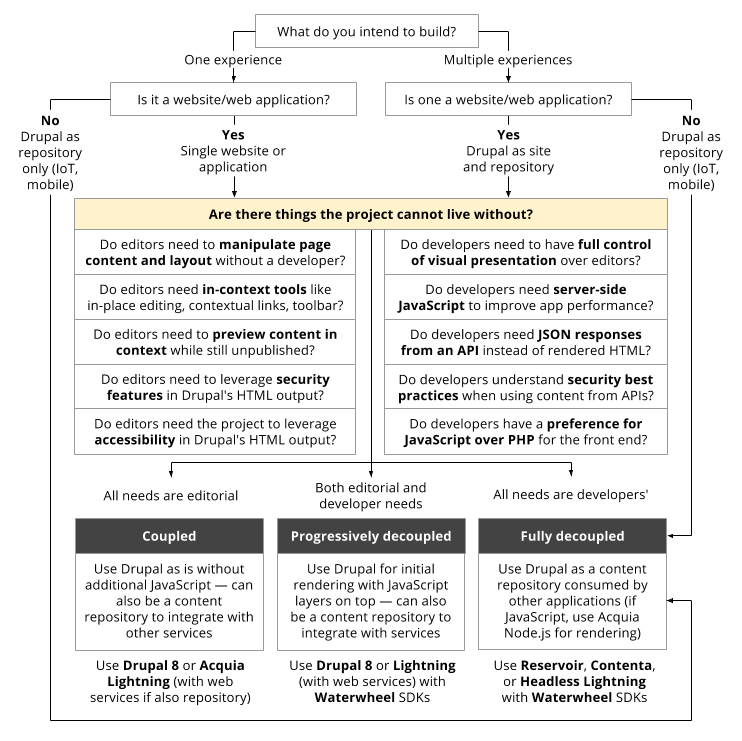 Many people have found the flowchart in that post to be useful in their decision-making on how to approach their Drupal architectures. Since that point, Drupal, its community, and the surrounding market have evolved, and the original flowchart needs a big update. Drupal’s API-first initiative has introduced new capabilities, and we’ve seen the advent of the Waterwheel ecosystem and API-first distributions like Reservoir, Headless Lightning, and Contenta. More developers both inside and outside the Drupal community are experimenting with Node.js and adopting fully decoupled architectures. The traditional approach to Drupal architecture, also referred to as coupled Drupal, is a monolithic implementation where Drupal maintains control over all front-end and back-end concerns. This is Drupal as we’ve known it — ideal for traditional websites. If you’re a content creator, keeping Drupal in its coupled form is the optimal approach, especially if you want to achieve a fast time to market without as much reliance on front-end developers. But traditional Drupal 8 also remains a great approach for developers who love Drupal 8 and want it to own the entire stack. What do you intend to build? The most important question to ask is what you are trying to build. If your plan is to create a single standalone website or web application, decoupling Drupal may or may not be the right choice based on the must-have features your developers and editors are asking for. If your plan is to create multiple experiences (including web, native mobile, IoT, etc. ), you can use Drupal to provide web service APIs that serve content to other experiences, either as (a) a content repository with no public-facing component or (b) a traditional website that is also a content repository at the same time. Today, Drupal makes it much easier to build applications consuming decoupled Drupal. Even if you’re using Drupal as a content repository to serve content to other applications, well-understood specifications like JSON API, GraphQL, OpenAPI, and CouchDB significantly lower its learning curve and open the door to tooling ecosystems provided by the communities who wrote those standards. In addition, there are now API-first distributions optimized to serve as content repositories and SDKs like Waterwheel.js that help developers “speak” Drupal. Are there things you can’t live without? Perhaps most critical to any decision to decouple Drupal is the must-have feature set desired for both editors and developers. In order to determine whether you should use a decoupled Drupal, it’s important to isolate which features are most valuable for your editors and developers. Unfortunately, there is are no black-and-white answers here; every project will have to weigh the different pros and cons. For example, many marketing teams choose a CMS because they want to create landing pages, and a CMS gives them the ability to lay out content on a page, quickly reorganize a page and more. The ability to do all this without the aid of a developer can make or break a CMS in marketers’ eyes. Similarly, many digital marketers value the option to edit content in the context of its preview and to do so across various workflow states. These kind of features typically get lost in a fully decoupled setting where Drupal does not exert control over the front end. How you reconcile this tension between developers’ needs and editors’ requirements will dictate which approach you choose. For teams that have an entirely editorial focus and lack developer resources — or whose needs are focused on the ability to edit, place, and preview content in context — decoupling Drupal will remove all of the critical linkages within Drupal that allow editors to make such visual changes. 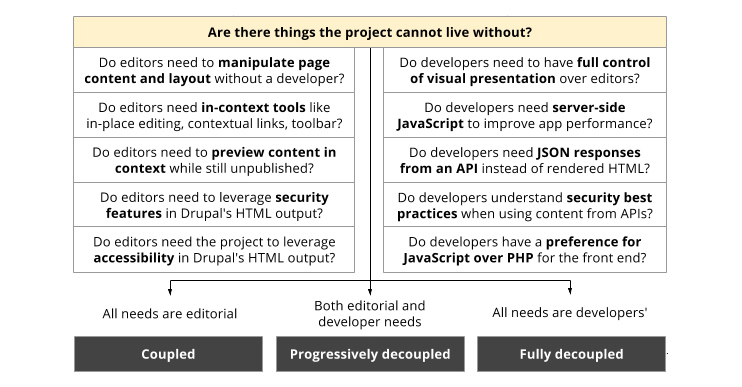 But for teams with developers itching to have more flexibility and who don’t need to cater to editors or marketers, fully decoupled Drupal can be freeing and allow developers to explore new paradigms in the industry — with the caveat that many of those features that editors value are now unavailable. In the future, and in light of the rapid evolution of decoupled Drupal, my hope is that Drupal keeps shrinking the gap between developers and editors. After all, this was the original goal of the CMS in the first place: to help content authors write and assemble their own websites. Drupal’s history has always been a balancing act between editorial needs and developers’ needs, even as the number of experiences driven by Drupal grows. I believe the next big hurdle is how to begin enabling marketers to administer all of the other channels appearing now and in the future with as much ease as they manage websites in Drupal today. In an ideal future, a content creator can build a content model once, preview content on every channel, and use familiar tools to edit and place content, regardless of whether the channel in question is mobile, chatbots, digital signs, or even augmented reality. Today, developers are beginning to use Drupal not just as a content repository for their various applications but also as a means to create custom editorial interfaces. It’s my hope that we’ll see more experimentation around conceiving new editorial interfaces that help give content creators the control they need over a growing number of channels. At that point, I’m sure we’ll need another new flowchart. Thankfully, Drupal is in the right place at the right time. We’ve anticipated the new world of decoupled CMS architectures with web services in Drupal 8 and older contributed modules. More recently, API-first distributions, SDKs, and even reference applications in Ember and React are giving developers who have never heard of Drupal the tools to interact with it in unprecedented ways. Unlike many other content management systems, old and new, Drupal provides a spectrum of architectural possibilities tuned to the diverse needs of different organizations. This flexibility between fully decoupling Drupal, progressively decoupling it, and traditional Drupal — in addition to each solution’s proven robustness in the wild — gives teams the ability to make an educated decision about the best approach for them. This optionality sets Drupal apart from new headless content management systems and most SaaS platforms, and it also shows Drupal’s maturity as a decoupled CMS over WordPress. In other words, it doesn’t matter what the team looks like or what the project’s requirements are; Drupal has the answer. Special thanks to Preston So for contributions to this blog post and to Alex Bronstein, Angie Byron, Gabe Sullice, Samuel Mortenson, Ted Bowman and Wim Leers for their feedback during the writing process.